The Beady Long Legs (ダマグモ?, lit. : "Orb Spider") is an enemy in the first two Pikmin games. The only attack it has is stomping around – which it does more quickly when damaged – and its multiple feet crush any Pikmin they land on. Its weak spot is its orbicular torso; given its height, Yellow Pikmin are normally needed. When defeated, it crumbles into dust that disintegrates after its belongings drop from its orbicular torso. The creature is in both the main game and Challenge Mode of both games it appears on. In Pikmin 2, the Beady Long Legs has a more brownish tone to its body, while in the first one it is just yellow. It also has slightly different shaped feet. Appearances in the second game are more common, and have much less health, slower movements, different cries, and their feet don't stick on the ground. When at low health, the Beady Long Legs will acquire a reddish tint and start smoking at the joints in Pikmin. In Pikmin 2, the creature's body will start to flake away at low health. 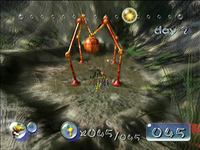 It first appears as a boss in Pikmin, where it is found in The Forest Navel, holding the Guard Satellite, and again in The Final Trial in Challenge Mode. In Pikmin 2, one appears on sublevel 5 of the Citadel of Spiders, where it drops a key which unlocks Challenge Mode, one on sublevel 14 of the Hole of Heroes, which holds the Fond Gyro Block, and one in the Twilight Garden in Challenge Mode (again holding The Key). Additionally, one more can be found in front of the landing site in the Perplexing Pool after day 30; killing this one yields 20 small 1-pellets. It appears every day if it is not killed and always spawns on the first day of each 10 day period starting from day 31. Despite rumors, it is not exclusive to palindrome days (33, 44, etc). The Beady Long Legs does not appear in Pikmin 3, but there are two new Arachnorb bosses similar to it, the Shaggy Long Legs and Baldy Long Legs. The Beady Long Legs petrified by ultra-bitter spray in Perplexing Pool. To do: Check what happens if its feet are damaged in all versions and regions of all games. Be careful when entering the boss's arena in Pikmin, since it can crush Pikmin when it falls down from the ceiling. This can catch unprepared players with large armies by surprise, but was changed for Pikmin 2: the Beady Long Legs will not be able to harm Pikmin until its introduction animation is over. You should have no more than 30 Pikmin, as a large group can be hard to control and may cause a few deaths. Aim at its core and launch your Pikmin freely, being careful to neither miss nor let the grounded Pikmin get stomped on. Group moving will prove helpful here. When it shivers, it is about to shake Pikmin off. Call the Pikmin quickly, or else they might fall off for a few seconds and lose their bud or flower status. In Pikmin 2, all Pikmin will be shaken off, but in Pikmin, a few may still remain latched. Attacking one of its feet in Pikmin will not cause any damage, but the creature will have difficulties landing it. If you have a viable amount of Yellow Pikmin, attack at will, but if not, bring twenty to thirty of some other types, preferably Red Pikmin, and wait until it has done eight stomps (two with each leg); it will lean down afterwards to rest. It will do this twice, so you should ignore it the first time, and then as soon as it begins to lean again, quickly throw Pikmin at its body. This will allow you to attack for a longer period of time. The Beady Long Legs can also be harmed by Pikmin attacking its feet; this is far more challenging and time-consuming, however. In Pikmin 2, only Purple Pikmin can damage the creature's feet with the stomp they cause, but in the Japanese version of the game, any Pikmin type can also attack its feet with regular attacks. As such, an easy way to defeat the Beady Long Legs in the Japanese version of Pikmin 2 is to place around 25 flowered Red Pikmin on the location where each foot is going to be, and when the creature lands from above, its health will be dropped so fast that it will not have time to stomp even once, ensuring a clean and quick victory. It may be difficult to determine exactly where the feet will end up at, though. This trick does not work in overseas versions of the game, nor the Wii release. In Pikmin, it is recommended to bring twenty Red Pikmin to the entrance of the arena, so they may bring the Guard Satellite through the fire geysers. Even when petrified, its body is suspended too high for leaders to reach. In Pikmin, the fastest way to defeat the creature is to have around 20 Red Pikmin and around 6 Yellow Pikmin with you. Before the boss lands, use / to organize your party so that Red Pikmin are the closest to you. Walk into the arena, and begin throwing Red Pikmin so that they attach to the creature when it lands; when the Beady Long Legs falls down, its core reaches low enough for non-Yellow Pikmin to be thrown at it. Throw as many Pikmin as you can, using the group move trick. When it shakes the Pikmin off, a few of them will remain attached. Carefully whistle the ones that got knocked down and throw them at the core again. The creature should be dead just as it's shaking the second time. In Pikmin, it has long been told that there is a rare and dangerous glitch that causes the Beady Long Legs to leave its arena. Once outside its boundaries, it would continue to pursue the player, and if the player tried to coax it to fall into the pit, the game would crash. It would also crash if left outside of its arena for too long. Proof of the glitch happening has never been given, and in fact, without editing the game's files to force the boss's territory radius to be larger than normal, there is no known way for the Beady Long Legs to walk far from its starting point. The word "Beady" in its name highlights its small and circular body. Its Japanese name, ダマグモ?, literally translates to "Orb Spider", once again reflecting the creature's spidery look and the spherical body. In the scientific name, Pseudoarachnia armoralis, armoralis comes from the Latin armum, which translates to "armor" and refers to its strong resistance. The creature's internal name in Pikmin 2 is the same as its Japanese name, damagumo, but in Pikmin, only the "spider" part of the word remains, making it kumo. Artwork of the Beady Long Legs. The Beady Long Legs in the enemy reel. The Beady Long Legs in the Piklopedia. A close-up of the Beady Long Legs in sublevel 5 of Citadel of Spiders. The Beady Long Legs begins to crumble and emit smoke as it becomes weaker. The Beady Long Legs explodes when it dies. The Beady Long Legs defeated, crumbling into dust. The Beady Long Legs as it first lands in sublevel 14 of Hole of Heros. The Beady Long Legs after it lands in the same cave. The Beady Long Legs in the unused cave Last_4, meant for enemy testing. The creature's e-card, #30 (10th yellow card). An earlier Beady Long Legs. The Beady Long Legs is shown during the last few seconds of a pre-release trailer of Pikmin. Here, the creature appears to be taller and have a reddish tint to its skin, as well as being in an outside area similar to The Forest of Hope. 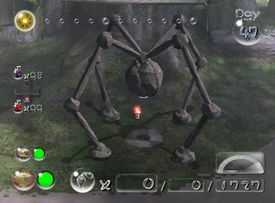 In the Citadel of Spiders cave in Pikmin 2, a shadow of a spider web is displayed on the arena floor. This also applies to one of its appearances in Challenge Mode in Pikmin 2 and to the arena of the Raging Long Legs in the the Hole of Heroes. It is unknown how Louie knows how to cook it, because in Pikmin 2, the Beady Long Legs falls apart very shortly after defeat. There is an unused object in Super Mario Galaxy that looks like an organic ball, which opens up much like the Beady Long Legs' core. In addition, the item's internal name is SpiderItemShell, further connecting it to the pseudo-arachnid. This enemy was meant to appear in Pikmin 3, but with its head changed to resemble one of its feet, as evidenced from some unused content in the game. In Super Mario 64 there is a quadrupedal spider-like enemy called a Scuttlebug that has a similar body pattern to the Beady Long Legs. This article was a featured article from May 6th to June 18th, 2009. This page was last edited on March 11, 2019, at 10:04.